I know I posted a sweet potato recipe last week and looking at my future post I have one scheduled again for next week. What can I say? We love sweet potatoes and I am having fun in the kitchen experimenting with creative ways to prepare and season them. In my opinion honey and cinnamon taste well when tossed together with some butter. I experimented with pan frying the sticks of sweet potatoe. In the past, I have used leftover sweet potato to fry up the next day. I wondered , "Could I cook the raw sweet potatoes by pan frying them and would they taste okay?" Personally I have never had great success cooking a raw potato without precooking it first by baking, boiling or steaming them first. I thought maybe the sweet potato would fall into this category too. My surprise success at pan frying the sticks of sweet potato is met with enthusiasm because I felt confident that my future cooking plans with this ingredient could be expanded to include them in more recipes. I am specifically thinking of using them in stir fry. I will continue to play with sweet potatoes so don't be surprised if a few more recipes emerge in the next few months. I don't believe that this is a Fall ingredient but one that we should be enjoying all year round. 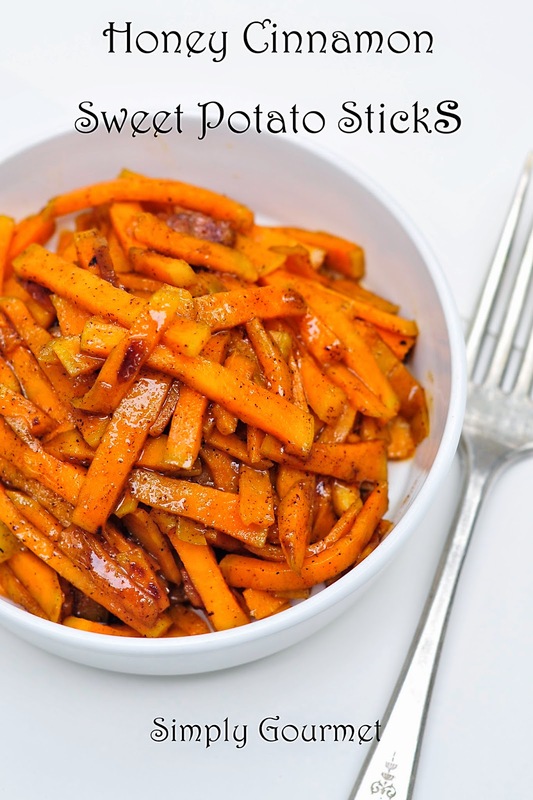 What is your favorite way to prepare sweet potatoes? I am open to new ideas. 1. Melt coconut oil in a medium frying pan. Add cut sweet potato sticks and cook until tender, about 8-10 minutes. Drizzle honey over the sticks and toss. 2. Remove from heat and sprinkle with seasonings. Use as much or little as you desire. If you wish to add some melted butter, go ahead at this time. Neat idea! And a great change from the more traditional ways to use sweet potatoes.